As a property owner who adores your lawn, you understand that fertilizer will play a critical role in assisting in achieving a lawn which is lush, green, and healthy. Since fertilizer is sold at any number of retailers in the area, you may question whether you should employ a lawn fertilizer service. Certainly, you may be tempted to attempt the do-it-yourself route; however, there is more to correct lawn fertilizing than merely tearing into a bag of fertilizer and sprinkling it around your lawn. As a matter of fact, there is a good deal of science behind this kind of lawn service. That is why employing a lawn fertilizer service includes a wise choice. A business which is well-versed in offering lawn fertilizer services is going to know what type of fertilizer your yard needs, how to properly apply it and when you should apply it, based upon your region, climate, and soil. Lawn fertilizer services understand that this procedure involves 3 main considerations: proper timing, proper amounts, and proper ingredients. Getting those 3 areas right may help your yard reach its highest potential. Proper ingredients. Fertilizing services know that fertilizer is available in various mixtures, and that it is crucial to decide which mixture is better for your yard’s individual needs. Lawn fertilizer comprises of 3 main nutrients: potassium, phosphorous, and nitrogen. Nitrogen will make grass plants grow, as well as become greener; phosphorus will stimulate seedling development and root growth, and potassium will promote drought and disease tolerance. The assessment of fertilizer will indicate the percentage of those 3 nutrients, and is printed upon the exterior of all fertilizer packages like 20-5-10 or 10-10-10. Those numbers will represent the percentages of nitrogen, phosphorous, as well as potassium within that particular mixture. Proper amounts. Lawn fertilizing on the correct schedule with the correct ingredients will work better when the right quantity is applied to your yard. The first thing you should do prior to applying fertilizer includes determining the lawn’s square footage. It’s possible to determine this number by multiplying your lawn’s length by its width. Next, subtract the home’s square footage, driveway and spaces not to be fertilized. For example, if there’s 34,020 total sq. ft., divide this figure by the allowance/bag to get the answer: 34,020 divided by 5,000 is 6.8. You’ll require around 7 bags of fertilizer. Proper scheduling. Fertilization treatment timing equally is important to accomplish a thriving, green, and healthy lawn. 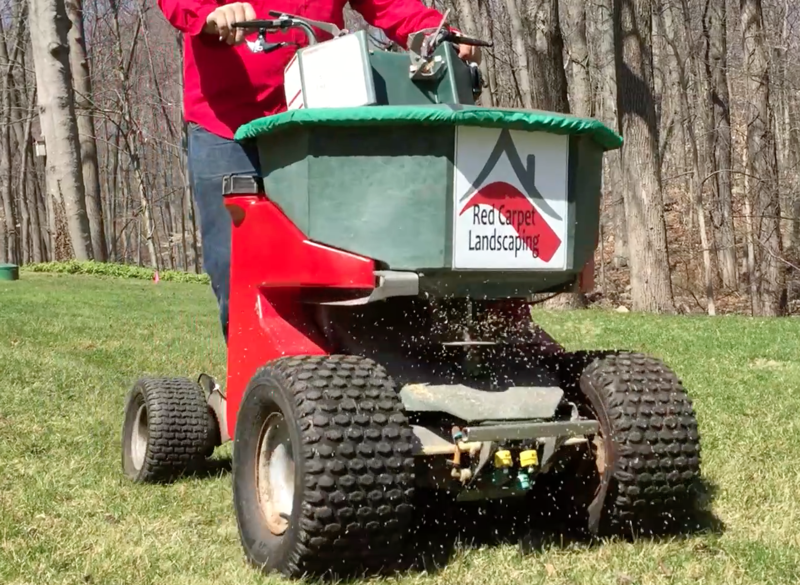 The proper fertilizing service will take into consideration the “nitrogen release rate”. How quickly nitrogen is released will determine how rapidly your grass is going to “green up, how much it’ll grow and how long your results will last. Grasses require a controlled, steady feeding to generate a green, thick lawn. Controlled-release lawn fertilizers produce just enough fast-release nitrogen to generate a quick greening, while the balance is gradually released by microbial action inside the soil over a span of roughly eight weeks. As a result, there’s a consistent nitrogen supply for your grass. Red Carpet Landscaping will take a scientifically customized approach to your yard are services. After signing up for a plan, a Red Carpet Landscaping PhD-certified specialist conducts a Healthy Lawn Analysis and will further customize a plan which matches your yard’s individual needs. Every full-service yard plan will include fertilization which utilizes a slow-release formula applied at key points within each season to maintain and stimulate growth. Plus, for as long as the plan is in place, the Red Carpet Landscaping Healthy Lawn Guarantee will remain in effect; it’ll give you the assurance that the specialist gladly will arrive to your home as often as necessary to make any adjustments that will ensure your satisfaction. For more details about our lawn fertilizer services, contact Red Carpet Landscaping at (203) 212-2498 today!